These implements work to improve seed-to-soil contact while planting and allow operators to adjust seeding rates by engaging or disengaging the seed boxes. 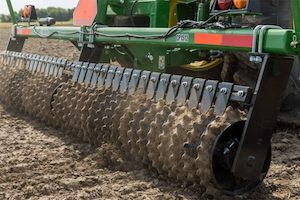 John Deere has announced that it is adding several implements, including cultipackers and three-point shank rippers, to its lineup of Frontier equipment. The goal is to cater to large-property owners and producers who need smaller-sized equipment to work behind compact and utility tractors. Frontier CP1148L, CP1172L, CP1572, CP1596 and CP1512 Cultipackers are compatible with compact and utility tractors ranging from 20 to 125 PTO horsepower. When it comes to the SR1202, SR1202 and SR1203 3-point shank rippers, these products can fracture hardpan as deep as 18 inches to help with root penetration. Frontier GS1148, GS1160, GS1172 and GS1184 Ground-Driven Overseeders can be used for primary seeding, overseeding and several other applications. “Large-property owners and small-acreage farmers and ranchers can use Frontier Ground-Driven Overseeders to plant anything from rye and oats to prairie grasses, legumes, wildflowers, radishes, soybeans and similar crops,” Geier continued. Frontier Ground-Driven Overseeders can be equipped with three seed-box options fitted with fluted seed cups and an agitator. Seeding rates can be adjusted as needed by engaging or disengaging the seedboxes on the overseeders. More information on these Frontier implements is available through your local John Deere dealer, or by visiting JohnDeere.com/Frontier.